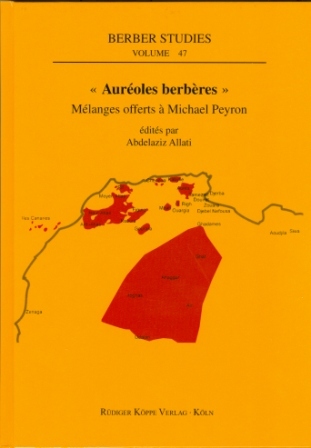 Michael Peyron (*1935) is a specialist in the field of Berber (especially Amazigh) language, literature and culture. He is equally known as a writer about tourism in Morocco. Born in the United Kingdom, he studied in France (Bordeaux and Grenoble). His doctoral thesis was about an Amazigh region in the mountains of High Atlas in Morocco. Peyron taught at the faculty of letters at the University Mohammed V in Rabat (1973–1988) and at the Department of English at Grenoble Uni­versity (1988–1995). In the late 1980s, the focus of his career switched from English to Amazigh studies. From 1995 to 1997, he became a visiting professor at the King Fahd School of translation (Tanger, Morocco) and since 1997, he is a visiting professor at Al Akhawayn University in Ifrane. He has been teaching Amazigh culture and language. The publications of Michael Peyron are numerous. Among his eminent works are two bilingual poetry volumes in French and Tamazight and a collection of fables in Tamazight and English. Since 1985, he has been contributing to the forthcoming Tamazight encyclopedia. No schwas in Amazigh open syllables – Why the mismatch? Under the following links you will find further Festschriften and obituary editions for renowned scholars published in our programme.